Some days I can’t imagine not sacrificing healthfulness on the altar of deliciousness. Unfortunately, my cholesterol test results just came in and–September’s triathlon now the most distant of bodily memories–the results were not pretty. I can cry genetics all I want, but 245 is 245. Stern, earnest voice message from my doctor about the importance of a low-fat diet aside, I have a hard time believing that eating fat makes you fat. I’m not an Atkin’s or low-carb person–extremes in eating portrayed as “the way” strike me as implausible and, really, I can’t swallow that heaps of meat and butter should be eaten to the exclusion of daily whole grains, even scrolling back intuition to the most diaphanous of lenses. The theory that eating fat necessarily makes one fat strikes me as primitive, if somewhat seductively so in its unapologetic simplicity, along the lines of the Mayans seeking to absorb the power of their enemies by eating their hearts. What bold, direct correlations to propose! Which is all to say that tonight’s self-thrown down dinner gauntlet was to cook something rich and satisfying without wholesale robbing the nutritional bank. The heavy-lifting flavor-wise, then, fell to so-called “good” fats, eschewing my well-worn cheddar crutch for a deconstructed pesto sauce focusing on the heart-healthy almond and olive oil, tossed with whole wheat pasta. 1. Put on water to boil, later adding pasta. 2. Toast slivered almonds on the stove on low heat for about 5 minutes. Pour them into a medium bowl and crush them with a fork until, well, smaller and crumblier. 3. Finely chop garlic and saute on medium-low heat for 3 minutes. 4. Chop the basil leaves. 5. 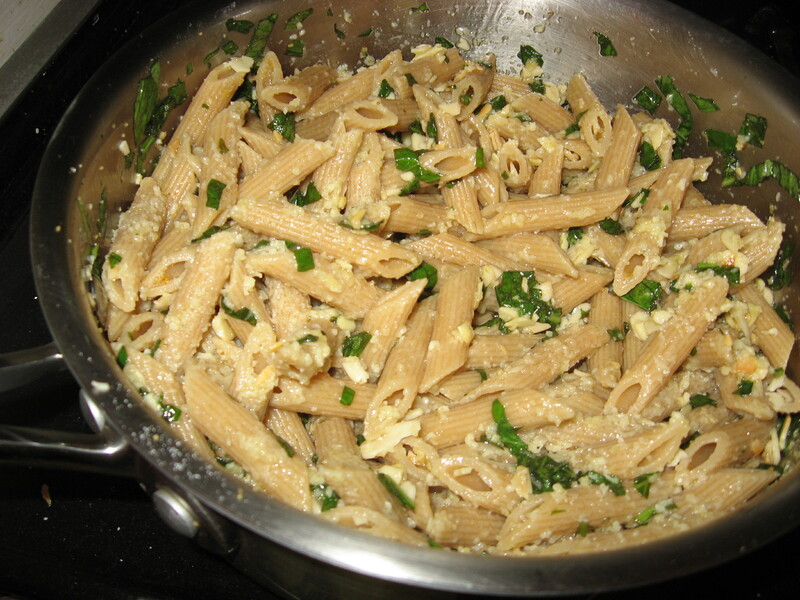 Drain pasta, tossing with the garlic oil, then stirring in basil, almonds, and Parmesan. Voila. This dish has slightly less vegetable in it than I would like, my goal being to maintain that ideal 1-1-1 starch-veggie-fat ratio that, truly, is the one and only golden one, Ancient Greek mathematicians and Renaissance artists be damned. Next time around, I’d probably add roughly chopped arugula for more color, flavor, and dark leafy green vegetable goodness.